For a number of years the gold output from Victoria was greater than in any other country in the world with the exception of the more extensive fields of California. Victoria's greatest yield for one year was in 1856, when 3,053,744 troy ounces (94,982 kg) of gold were extracted from the diggings. From 1851 to 1896 the Victorian Mines Department reported that a total of 61,034,682 oz (1,898,391 kg) of gold was mined in Victoria. 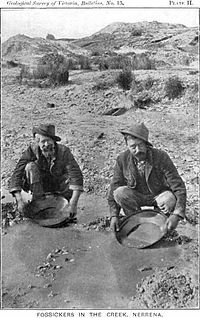 In the 1850s gold discoveries in Victoria, in Beechworth, Castlemaine, Daylesford, Ballarat and Bendigo sparked gold rushes similar to the California Gold Rush. At its peak some two tonnes of gold per week flowed into the Treasury Building in Melbourne. The gold exported to Britain in the 1850s paid all her foreign debts and helped lay the foundation of her enormous commercial expansion in the latter half of the century. Melbourne was a major boomtown during the gold rush. The city became the centre of the colony with rail networks radiating to the regional towns and ports. Politically, Victoria's goldminers sped up the introduction of greater parliamentary democracy in Victoria, based on British Chartist principles adopted to some extent by the miners' activist bodies such as Bendigo's Anti-Gold Licence Association and the Ballarat Reform League. As the alluvial gold dwindled, pressures for land reform, protectionism and political reform generated social struggles. and a Land Convention in Melbourne during 1857 recorded demands for land reform. By 1854 Chinese people were contributing to the gold rushes. Their presence on the goldfields of Bendigo, Beechworth and the Bright district resulted in riots, entry taxes, killings and segregation in the short term, and became the foundations of the White Australia policy. In short, the gold rush was a revolutionary event and reshaped Victoria, its society and politics. There were rumours abroad about the presence of gold in Australia, but Government officials kept all findings secret for fear of disorganising the young colony. However the Colonial Secretary, Edward Deas Thomson, saw a great future for the country when Edward Hargraves proved his theory that Australia was a vast storehouse of gold. Hargraves had been in the California gold rush and knew gold country, when he first saw it, round Bathurst. The news spread like wildfire, and soon the race was on from coast to gold fields. Flocks were left untended, drovers deserted their teams, merchants and lawyers rushed from their desks and entire ships' crews, captains included, marched off to seek their fortunes. In March 1850, Mr. W. Campbell of Strath Loddon found on the station of Mr. Donald Cameron, of Clunes several minute pieces of native gold in quartz. This was concealed at the time but on 10 January 1851, Campbell disclosed it. Others had found indications of gold. 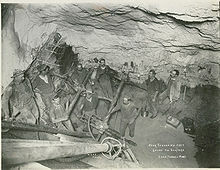 Dr. George H. Bruhn, a German physician, whose services as an analyst were in great demand, had been shown specimens of gold from what afterwards became the Clunes diggings. In spite of these and other discoveries, however, it was impracticable to market the gold, and James Esmond's "find" which was made on Creswick's Creek, a tributary of the Loddon River, at Clunes on 1 July 1851, was the first marketable gold field. A party formed by Mr. Louis John Michel, consisting of himself, Mr. William Haberlin, James Furnival, James Melville, James Headon, and B. Groenig, discovered the existence of gold in the quartz rocks of the Yarra ranges, at Andersons Creek, near Warrandyte, in the latter part of June, and showed it on the spot to Dr. Webb Richmond, on behalf of the Gold Discovery Committee on 5 July. The third discovery was by Mr. Thomas Hiscock, a resident at Buninyong; induced by the writings of the Rev. W. B. Clarke, and by the discovery of Brentani's nugget in the Pyrenees district two years before, he had kept a constant lookout for gold in his neighbourhood. He discovered an auriferous deposit in the gully of the Buninyong ranges now bearing his name, on 8 August 1851, and he communicated the fact, with its precise locality, to the editor of the Geelong Advertiser on the 10th of that month. Dr. George H. Bruhn, a German physician, in the month of January, 1851, (i.e. before Mr. Hargraves' discovery at Summerhill) started from Melbourne to explore "the mineral resources of this colony'. During his lengthened tour, he found, in April, indications of gold in quartz about two miles from Mr. Barker's station, and on arriving at Mr. Cameron's station was shown by that gentleman specimens of gold at what are now called the Clunes diggings. This information he made widely known through the country in the course of his journey, and communicated to Mr. James Esmond, at that time engaged in erecting a building at Mr. James Hodgkinson's station. Dr. Bruhn forwarded specimens, which were received by the Gold Discovery Committee on 30 June 1851. The Gold Discovery Committee awarded £1000 to Michel and his party; £1000 to Hiscock, as the substantial discoverer of the Ballarat deposits; £1000 to Campbell as the original discoverer of Clunes; £1000 to Esmond as the first active producer of alluvial gold for the market and £500 to Dr. Bruhn. On 20 July 1851 Thomas Peters, a hut-keeper on William Barker's Mount Alexander station, found specks of gold at what is now known as Specimen Gully. This find was published in the Melbourne Argus on 8 September 1851, leading to a rush to the Mount Alexander or Forest Creek diggings, centred on present-day Castlemaine, claimed as the richest shallow alluvial goldfield in the world. These discoveries were soon surpassed by Ballarat and Bendigo. Further discoveries including Beechworth in 1852, Bright, Omeo, Chiltern (1858–59) and Walhalla followed. Surface alluvial gold was the first to be exploited. It is reported that in 1851, when the first miners arrived on the Mount Alexander goldfield, near Castlemaine, nuggets could be picked up without digging. Then followed the exploitation of alluvial gold in creeks and rivers, or deposited in silt on river banks and flats. The gold-seekers used pans, sluice boxes and cradles to separate this gold from the dirt. As surface alluvial gold ran out, gold seekers were forced to look further underground. Miners discovered so-called deep leads, which were gold-bearing watercourses that had been buried at various depths by centuries of silting and, in some Victorian goldfields such as Ballarat, volcanic action. They also began to exploit the underground gold reefs which were the original sources of the gold. Deep mining was more difficult and dangerous. Places such as Bendigo and Ballarat saw great concentrations of miners, who were forming partnerships and syndicates to enable them to sink ever-deeper shafts. Coupled with erratic and vexatious policing and licence checks, tensions flared around Beechworth, Bendigo and Ballarat. These frictions culminated in the Eureka Rebellion in Ballarat in 1854. Following that uprising, a range of reforms gave miners a greater say in resolving disputes via Mining Courts, and extended electoral franchise to them. As gold-rush immigrants flooded into Victoria in 1852, a tent city, known as Canvas Town, was established at South Melbourne. The area soon became a massive slum, home to tens of thousands of migrants from around the world who arrived to seek their fortunes in the goldfields. Significant "Chinatowns" became established in Melbourne, Bendigo and Castlemaine. The conditions which led up to the Eureka Stockade arose mainly from the actions taken by the Government in supervising the various goldfields. To meet the expense of securing order and to restrain unauthorised mining on Crown land, a local Act of January 1852 imposed on all diggers a licence fee of 30 shillings per month, the penalty for mining without a licence being £6 for the first offence and afterwards imprisonment for terms up to six months. Clause 7 of this Act also appropriated half the fine to the use of the informer or prosecutor, a provocative and irritating provision. In December, 1853, an amending Act reduced the fee to £1 per month, but did not alter the diggers' greatest grievance, that they could be imprisoned for not having the actual licence on them, though their possession of one could be proved from the official record. They were also unrepresented in Parliament, and in 1854 the population on the Ballarat goldfields was estimated at 20,000. Charles Hotham, who arrived in Victoria in June 1854, was alarmed at the depleted state of the Treasury and the growing expense of goldfields administration. He ordered the police to redouble their exertions in collecting the fees. To miners just scraping by, the payment of £12 per annum was impossible, and there is no doubt that hundreds did endeavour to evade payment, but the innocent suffered with the guilty. The police, too, had been largely recruited from Tasmania, and many were ex-convicts. These grievances were common to all the Victorian fields, and had under Latrobe's administration produced riots at Beechworth and Castlemaine, but Ballarat, always the most domestic of the goldfields, was renowned for its peaceful progressiveness and quietness. On the night of 6 October, however, a Scottish miner named James Scobie was killed at the Eureka Hotel, near Ballarat, and the murdered man's associate accused the proprietor (Bentley, a Tasmanian ex-convict) of the murder. Bentley was brought up before a magistrate, who was alleged to be financially under Bentleys' thumb, and he was discharged. The miners were indignant; a meeting was called and a demand made for a fresh prosecution. The meeting itself was orderly, but towards the end of proceedings a cry was raised that the police (who had been ordered to protect the hotel) were trying to disperse the meeting, and the miners, becoming furious, swept aside the police, smashed the windows and furniture, and burned the building. The police arrested three men- who could not be proved to have been ringleaders or active in the riot, and they were sentenced to three, four, and six months' imprisonment. At an indignation meeting held on 11 November on Bakery Hill, the Ballarat Reform League was formed, with J. B. Humffray (a Welshman) as its first secretary, and Peter Lalor, Frederic Vern (a Hanoverian), Raffaello (an Italian teacher, of languages), Timothy Hayes (an Irishman), and George Black, a well-educated Englishman, as prominent members. A deputation of three men waited on Governor Hotham to demand the release of the prisoners, but he refused and had already sent additional troops to Ballarat, which gave considerable offence by marching through the town with fixed bayonets and by other exasperating conduct. On 29 November, Black, Humffray, and Kennedy reported to a mass meeting held at Bakery Hill the result of their deputation to the Governor, and Vern proposed a burning of the hated licences, which was then carried out. Next day the police carried out a specially vicious and vigorous licence-hunt, and when the troops marched back to camp, the diggers hastened to a conference with the leaders of the Reform League. Peter Lalor was elected leader, and under a blue flag adorned with the stars of the Southern Cross the assembled diggers swore 'to stand truly by each other and fight to defend our rights and liberties.' An area of about an acre on the present Eureka site was hastily enclosed with a pallisade and a deputation was sent to the military camp demanding the release of the morning's prisoners and the cessation of licence-hunting. The Commissioner flatly refused the request, saying that the agitation was 'only a cloak to cover a democratic revolution.' On 1 December the occupants of the stockade were hard at work by 5 a.m. drilling and improving the barrier, and a German blacksmith was fashioning pike-heads. But neither food nor ammunition was available within the stockade, so that by the evening of the 2nd after a very hot day, not more than 200 remained within. Spies informed the Commissioner of the situation and about 4.30 a.m. on Sunday morning (3 December) a troop of 276 men was marched silently to the stockade. Inside the stockade only 50 diggers had rifles; there was also a troop of Californian diggers armed with revolvers and another of Irishmen with pikes. Many of them were asleep when the signal gun was fired and a storming party of 64 'rushed' the stockade. In the first volleys several men fell on both sides, but the line of advancing bayonets, flanked on both sides by cavalry and mounted police, was too much for the diggers. They turned to seek shelter and all was over. Of the military force Captain Wise and four private soldiers were killed, and about a dozen injured. Sixteen miners were killed, and at least eight others died of their wounds, 114 prisoners were taken, and Lalor, badly wounded, managed to escape; so did Black and Vern. The Government then offered £500 for the apprehension of Vern, and £200 each for Black and Lalor. Australia's population changed dramatically as a result of the rushes. In 1851 the Australian population was 437,655, of which 77,345, or just under 18%, were Victorians. A decade later the Australian population had grown to 1,151,947 and the Victorian population had increased to 538,628; just under 47% of the Australian total and a seven-fold increase. In some small country towns where gold was found abundantly, the population could grow by over 1000% in a decade (e.g. Rutherglen had a population of about 2,000. Ten years later, it had approximately 60,000 which is a 3000% increase). The rapid growth was predominantly a result of the gold rushes. The gold rush is reflected in the architecture of Victorian gold-boom cities like Melbourne, Castlemaine, Ballarat, Bendigo and Ararat. Ballarat today has Sovereign Hill—a 60-acre (24 ha) recreation of a gold rush town—as well as the Gold Museum. Bendigo has a large operating gold mine system which also functions as a tourist attraction. The rushes left Victorian architecture in towns in the Goldfields region such as Maldon, Beechworth, Clunes, Heathcote, Maryborough, Daylesford, Stawell, Beaufort, Creswick, St Arnaud, Dunolly, Inglewood, Wedderburn and Buninyong whose economy has differing emphases on home working, tourism, farming, modern industrial and retired sectors. With the exception of Ballarat and Bendigo, many of these towns were substantially larger than they are today. Most populations moved to other districts when gold played out in a given locality. At the other end of the spectrum ghost towns, such as Walhalla, Mafeking and Steiglitz exist. The last major gold rush in Victoria was at Berringa, south of Ballarat, in the first decade of the 20th century. Gold mining became nothing more than a hobby in Victoria for decades mainly because of the depth and cost of pumping. The First World War also drained Australia of the labour needed to work the mines. More significantly, the prohibition on the export of gold from Australia in 1915 and the abolition of the gold standard, winding down stockpiling of gold and production of sovereigns throughout the Empire saw Australian gold towns shrink, in some cases, being totally abandoned. The slump in gold production never recovered. Gold mining ceased in Stawell in 1920, but recommenced in 1982 and continues as at 2014. However, as of 2005 the recent increase in the gold price has seen a resurgence in commercial mining activity with mining resuming in both of the major fields of Bendigo and Ballarat. Exploration also proceeds elsewhere, for example, in Glen Wills, an isolated mountain area near Mitta Mitta in north-eastern Victoria. ^ Rickard, John (2017). Australia: A Cultural History. p. 64. ISBN 978-1-921867-60-6. ^ "Not in Our Day". The Argus. Melbourne. 5 October 1934. p. 8. Retrieved 1 February 2012 – via National Library of Australia. . Also see The Argus, 31 January 1849, referenced in the same newspaper of 2 February 1849. ^ "Looking back to our golden past". The Argus. Melbourne. 10 September 1949. p. 8 Supplement: The Argus Week–end Magazine. Retrieved 14 February 2012 – via National Library of Australia. ^ "Gold production of Victoria". The Examiner (DAILY ed.). Launceston, Tasmania. 6 June 1907. p. 2. Retrieved 27 April 2013 – via National Library of Australia. ^ "Keep It Quiet!". The Examiner (DAILY ed.). Launceston, Tasmania. 15 February 1934. p. 6. Retrieved 14 February 2012 – via National Library of Australia. ^ "100 years (it's really more!) of diggings". The Argus. Melbourne. 11 September 1951. p. 2. Retrieved 14 February 2012 – via National Library of Australia. ^ "In The Paths Of The Explorers Gold Brings Australia Wealth". The Sydney Morning Herald. 20 November 1946. p. 3 Supplement: Playtime. Retrieved 27 January 2012 – via National Library of Australia. ^ "Old Story Retold". The Argus. Melbourne. 14 January 1928. p. 6. Retrieved 24 January 2012 – via National Library of Australia. ^ a b "COUNCIL PAPER". The Sydney Morning Herald. 28 March 1854. p. 2. Retrieved 25 January 2012 – via National Library of Australia. ^ "Cradle Of Australian Democracy". The Worker. Brisbane, Queensland. 12 December 1939. p. 9. Retrieved 15 February 2012 – via National Library of Australia. ^ "150 years of Gold Mining in Victoria." Archived 11 February 2008 at the Wayback Machine Stawell Historical Society. Ian D Clark (2003) ‘That's my country belonging to me' – Aboriginal land tenure and dispossession in nineteenth century Western Victoria, Ballarat Heritage Services, Ballarat.